Download "N. Gregory Mankiw Principles of Economics. Chapter 15. MONOPOLY"
2 Figure 2 d. The area of deadweight loss is marked DWL in the figure. Deadweight loss means that the total surplus in the economy is less than it would be if the market were competitive, since the monopolist produces less than the socially efficient level of output. e. If the author were paid $3 million instead of $2 million, the publisher wouldn t change the price, since there would be no change in marginal cost or marginal revenue. The only thing that would be affected would be the firm s profit, which would fall. f. To maximize economic efficiency, the publisher would set the price at $10 per book, since that s the marginal cost of the book. At that price, the publisher would have negative profits equal to the amount paid to the author. 3 Figure 3 2. Figure 3 illustrates a natural monopolist setting price, P ATC, equal to average total cost. The equilibrium quantity is Q ATC. Marginal cost pricing would yield the price P MC and quantity Q MC. For quantities between Q ATC and Q MC, the benefit to consumers (measured by the demand curve) exceeds the cost of production (measured by the marginal cost curve). This means that the deadweight loss from setting price equal to average total cost is the triangular area shown in the figure. 3. Mail delivery has an always-declining average-total-cost curve, since there are large fixed costs for equipment. The marginal cost of delivering a letter is very small. However, the costs are higher in isolated rural areas than they are in densely populated urban areas, since transportation costs differ. Over time, increased automation has reduced marginal cost and increased fixed costs, so the average-total-cost curve has become steeper at small quantities and flatter at high quantities. 4. If the price of tap water rises, the demand for bottled water increases. This is shown in Figure 4 as a shift to the right in the demand curve from D 1 to D 2. The corresponding marginal-revenue curves are MR 1 and MR 2. The profit-maximizing level of output is where marginal cost equals marginal revenue. Prior to the increase in the price of tap water, the profit-maximizing level of output is Q 1 ; after the price increase, it rises to Q 2. 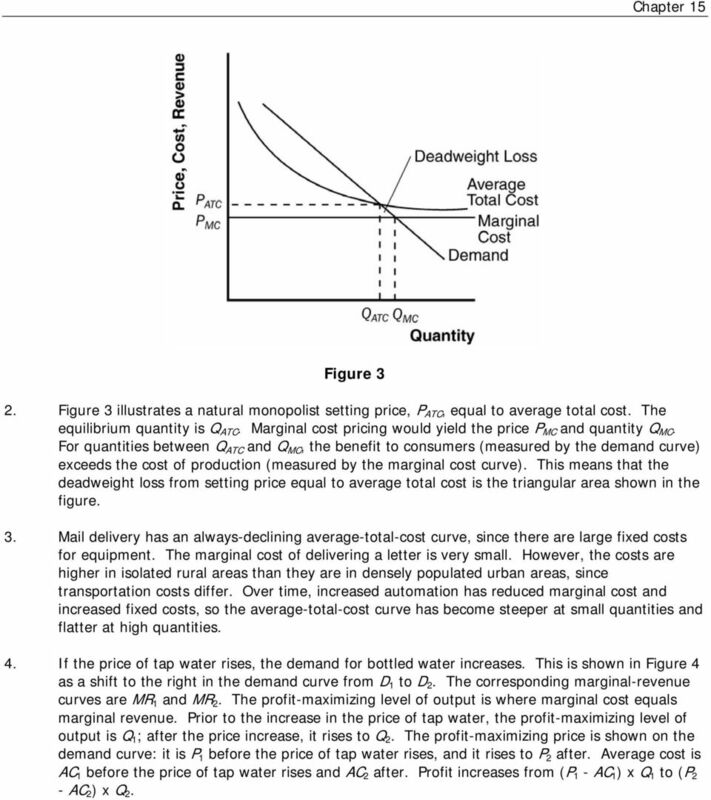 The profit-maximizing price is shown on the demand curve: it is P 1 before the price of tap water rises, and it rises to P 2 after. Average cost is AC 1 before the price of tap water rises and AC 2 after. Profit increases from (P 1 - AC 1 ) x Q 1 to (P 2 - AC 2 ) x Q 2. 4 Figure 4 5. a. 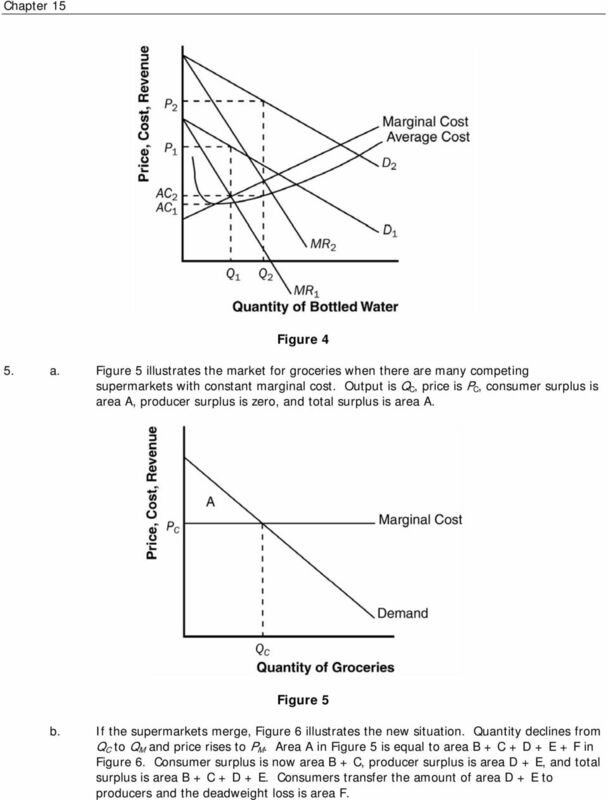 Figure 5 illustrates the market for groceries when there are many competing supermarkets with constant marginal cost. Output is Q C, price is P C, consumer surplus is area A, producer surplus is zero, and total surplus is area A. Figure 5 b. If the supermarkets merge, Figure 6 illustrates the new situation. Quantity declines from Q C to Q M and price rises to P M. Area A in Figure 5 is equal to area B + C + D + E + F in Figure 6. Consumer surplus is now area B + C, producer surplus is area D + E, and total surplus is area B + C + D + E. Consumers transfer the amount of area D + E to producers and the deadweight loss is area F.
5 Figure 6 6. a. The following table shows total revenue and marginal revenue for each price and quantity sold: Price Quantity Total Marginal Total Profit Revenue Revenue Cost 24 10,000 $ 240, $ 50,000 $ 190, , ,000 $ , , , , , , , , , , , , , , , , , ,000 b. Profits are maximized at a price of $16 and quantity of 50,000. At that point, profit is $550,000. c. As Johnny's agent, you should recommend that he demand $550,000 from them, so he instead of the record company receives all of the profit. 7. IBM's monopoly power will be constrained to the extent that people can substitute other computers for mainframes. So the government might have looked at the demand curve facing IBM, or the divergence between IBM's price and marginal cost, to get some idea of how severe the monopoly problem was. 8. a. The table below shows total revenue and marginal revenue for the bridge. The profitmaximizing price would be where revenue is maximized, which will occur where marginal revenue equals zero, since marginal cost equals zero. This occurs at a price of $4 and quantity of 400. The efficient level of output is 800, since that's where price equals marginal cost equals zero. The profit-maximizing quantity is lower than the efficient quantity because the firm is a monopolist. 6 Price Quantity Total Revenue Marginal Revenue $ 8 0 $ $ , , , , , b. The company should not build the bridge because its profits are negative. The most revenue it can earn is $1,600,000 and the cost is $2,000,000, so it would lose $400,000. 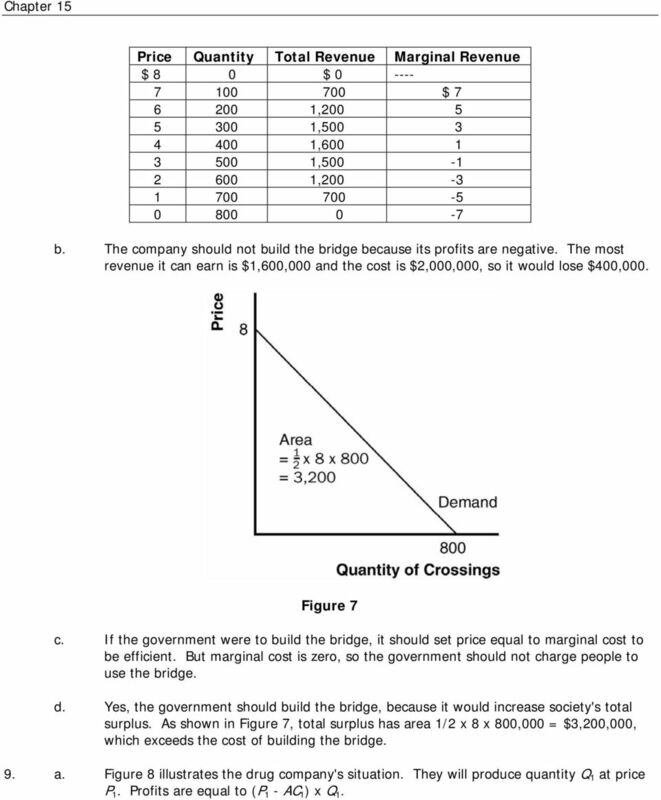 Figure 7 c. If the government were to build the bridge, it should set price equal to marginal cost to be efficient. But marginal cost is zero, so the government should not charge people to use the bridge. d. Yes, the government should build the bridge, because it would increase society's total surplus. As shown in Figure 7, total surplus has area 1/2 x 8 x 800,000 = $3,200,000, which exceeds the cost of building the bridge. 9. a. Figure 8 illustrates the drug company's situation. They will produce quantity Q 1 at price P 1. Profits are equal to (P 1 - AC 1 ) x Q 1. 7 Figure 8 b. 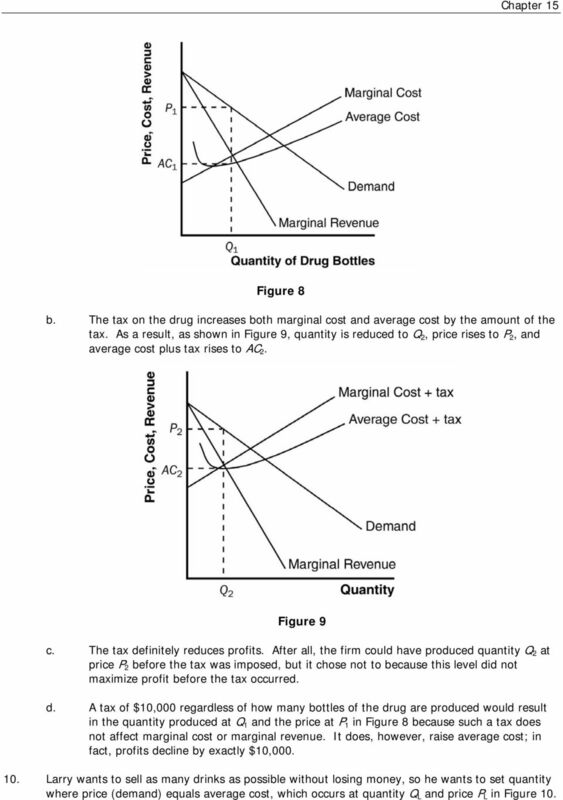 The tax on the drug increases both marginal cost and average cost by the amount of the tax. As a result, as shown in Figure 9, quantity is reduced to Q 2, price rises to P 2, and average cost plus tax rises to AC 2. Figure 9 c. The tax definitely reduces profits. After all, the firm could have produced quantity Q 2 at price P 2 before the tax was imposed, but it chose not to because this level did not maximize profit before the tax occurred. d. A tax of $10,000 regardless of how many bottles of the drug are produced would result in the quantity produced at Q 1 and the price at P 1 in Figure 8 because such a tax does not affect marginal cost or marginal revenue. It does, however, raise average cost; in fact, profits decline by exactly $10, Larry wants to sell as many drinks as possible without losing money, so he wants to set quantity where price (demand) equals average cost, which occurs at quantity Q L and price P L in Figure 10. 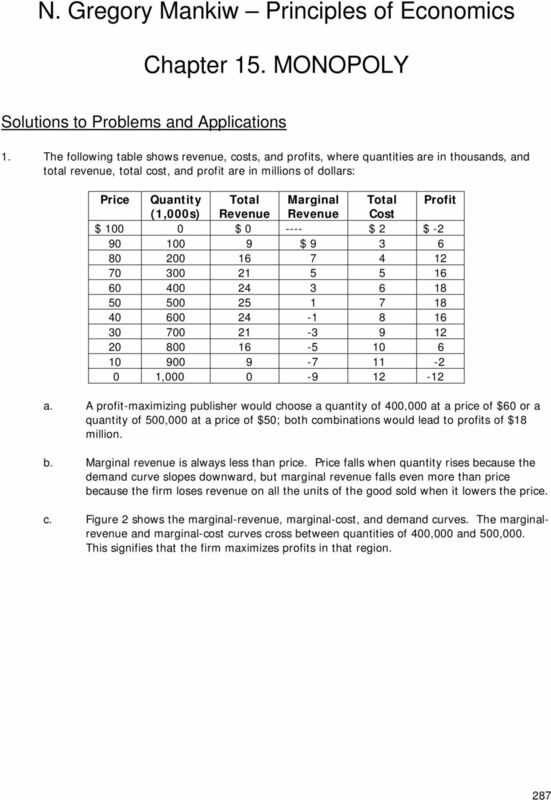 8 Curly wants to bring in as much revenue as possible, which occurs where marginal revenue equals zero, at quantity Q C and price P C. Moe wants to maximize profits, which occurs where marginal cost equals marginal revenue, at quantity Q M and price P M. Figure a. Long-distance phone service was originally a natural monopoly because installation of phone lines across the country meant that one firm's costs were much lower than if two or more firms did the same thing. b. With communications satellites, the cost is no different if one firm supplies them or if many firms do so. So the industry evolved from a natural monopoly to a competitive market. c. It is efficient to have competition in long-distance phone service and regulated monopolies in local phone service because local phone service remains a natural monopoly (being based on land lines) while long-distance service is a competitive market (being based on satellites). 12. a. The patent gives the company a monopoly, as shown in Figure 11. At a quantity of Q M and price of P M, consumer surplus is area A + B, producer surplus is area C + D, and total surplus is area A + B + C + D.
9 Figure 11 b. If the firm can perfectly price discriminate, it will produce quantity Q C and extract all the consumer surplus. Consumer surplus is zero and producer surplus is A + B + C + D + E, as is total surplus. Deadweight loss is reduced from area E to zero. There is a transfer of surplus from consumers to producers of area A + B. 13. A monopolist always produces a quantity at which the demand curve is elastic. If the firm produced a quantity for which the demand curve were inelastic, then if the firm raised its price, quantity would fall by a smaller percentage than the rise in price, so revenue would increase. Since costs would decrease at a lower quantity, the firm would have higher revenue and lower costs, so profit would be higher. Thus the firm should keep raising its price until profits are maximized, which must happen on an elastic portion of the demand curve. Another way to see this is to note that on an inelastic portion of the demand curve, marginal revenue is negative. Increasing quantity requires a greater percentage reduction in price, so revenue declines. Since a firm maximizes profit where marginal cost equals marginal revenue, and marginal cost is never negative, the profit-maximizing quantity can never occur where marginal revenue is negative, so can never be on an inelastic portion of the demand curve. 14. Though Britney Spears has a monopoly on her own singing, there are many other singers in the market. 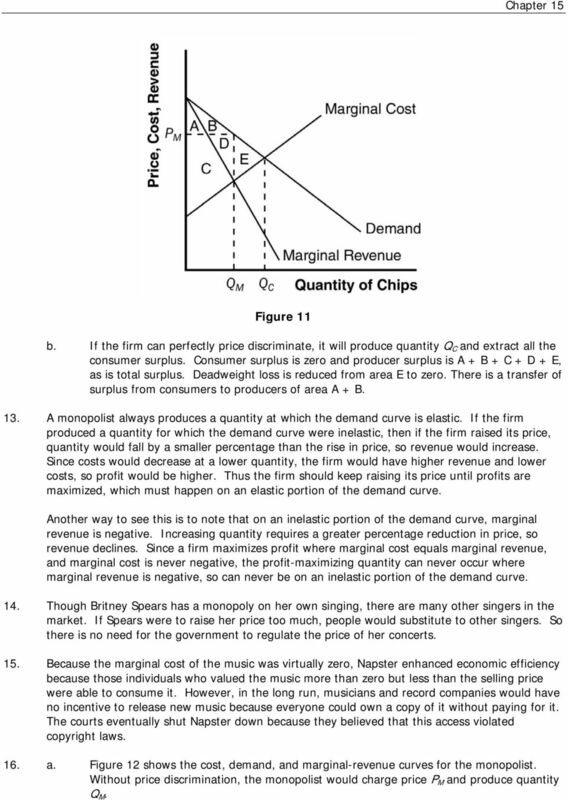 If Spears were to raise her price too much, people would substitute to other singers. So there is no need for the government to regulate the price of her concerts. 15. Because the marginal cost of the music was virtually zero, Napster enhanced economic efficiency because those individuals who valued the music more than zero but less than the selling price were able to consume it. However, in the long run, musicians and record companies would have no incentive to release new music because everyone could own a copy of it without paying for it. The courts eventually shut Napster down because they believed that this access violated copyright laws. 16. a. 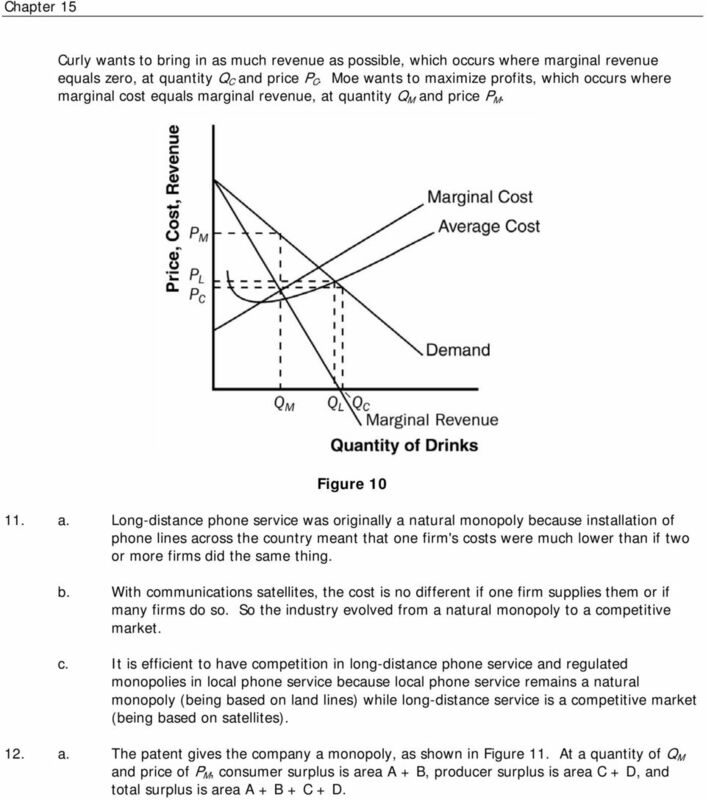 Figure 12 shows the cost, demand, and marginal-revenue curves for the monopolist. 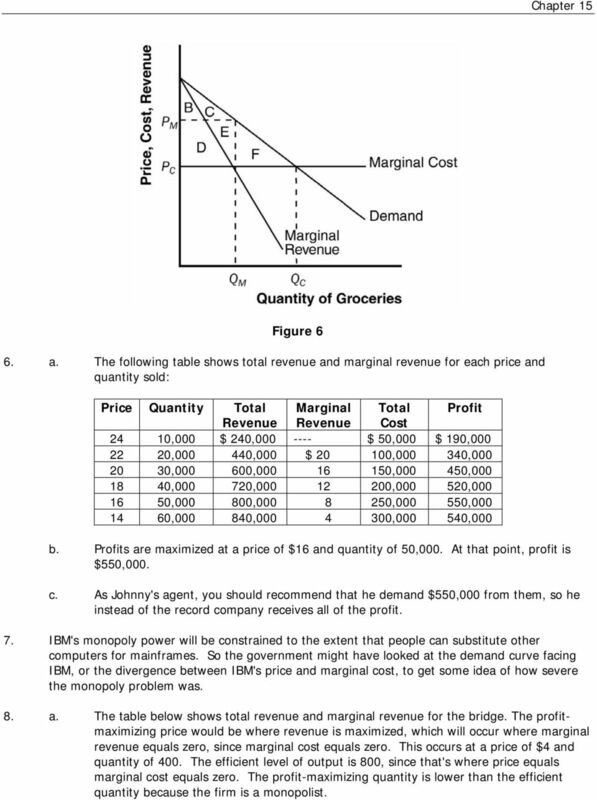 Without price discrimination, the monopolist would charge price P M and produce quantity Q M.
10 Figure b. 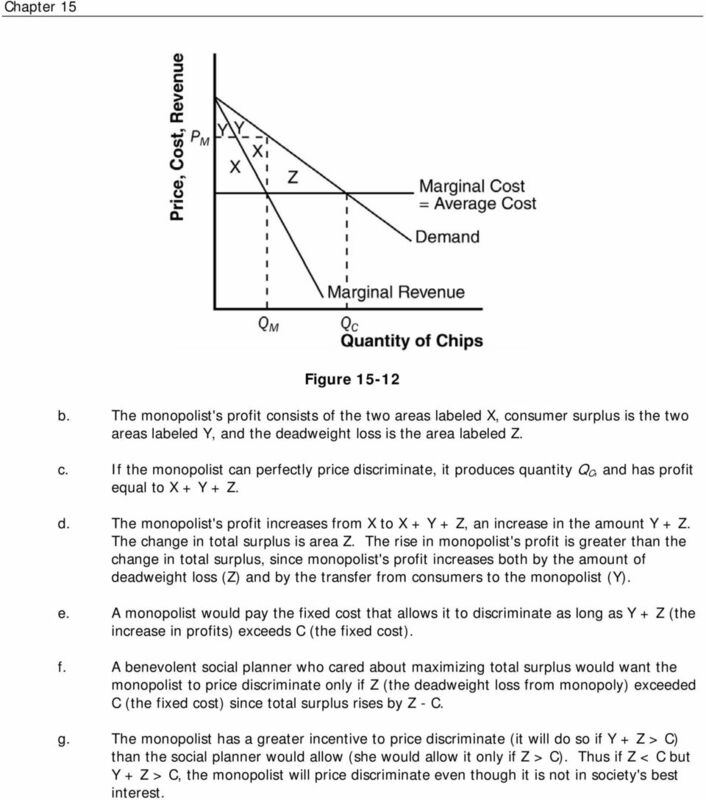 The monopolist's profit consists of the two areas labeled X, consumer surplus is the two areas labeled Y, and the deadweight loss is the area labeled Z. c. If the monopolist can perfectly price discriminate, it produces quantity Q C, and has profit equal to X + Y + Z. d. The monopolist's profit increases from X to X + Y + Z, an increase in the amount Y + Z. The change in total surplus is area Z. The rise in monopolist's profit is greater than the change in total surplus, since monopolist's profit increases both by the amount of deadweight loss (Z) and by the transfer from consumers to the monopolist (Y). e. A monopolist would pay the fixed cost that allows it to discriminate as long as Y + Z (the increase in profits) exceeds C (the fixed cost). 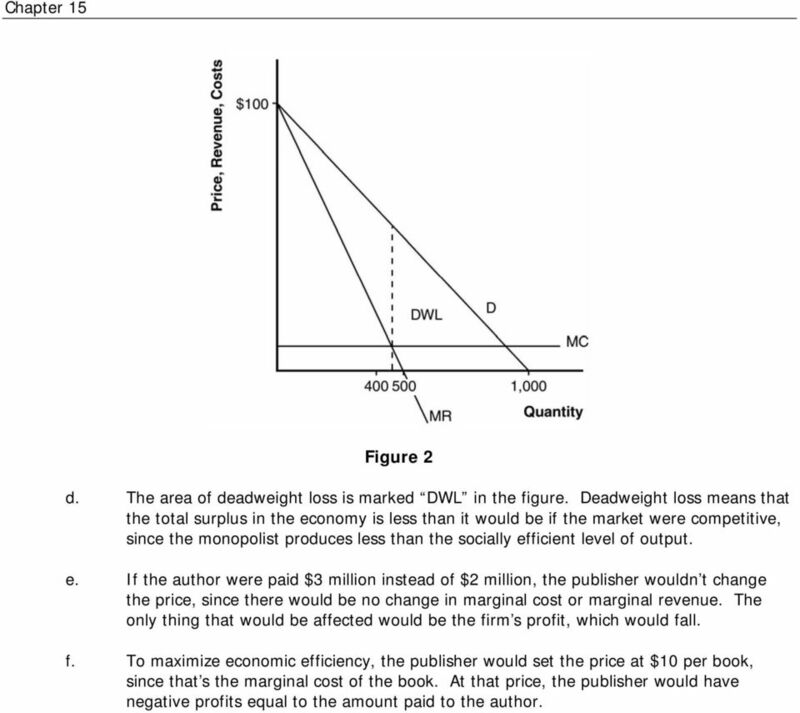 f. A benevolent social planner who cared about maximizing total surplus would want the monopolist to price discriminate only if Z (the deadweight loss from monopoly) exceeded C (the fixed cost) since total surplus rises by Z - C. g. The monopolist has a greater incentive to price discriminate (it will do so if Y + Z > C) than the social planner would allow (she would allow it only if Z > C). Thus if Z < C but Y + Z > C, the monopolist will price discriminate even though it is not in society's best interest. Directions: This problem set is graded. Feel free to ask me questions. Turn your answers in on the provided scantron form. What are the conditions that lead to a perfectly competitive market?